Bitcoin is displaying a modicum of strength on the current shoulder, in what appears to be an inverted head-and-shoulders chart pattern formation. 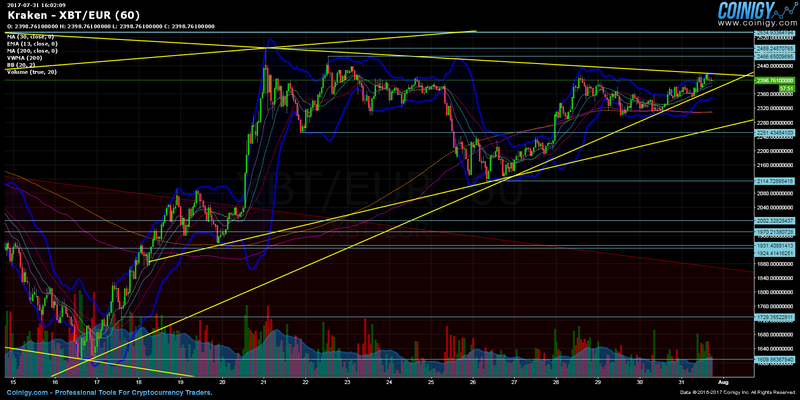 As to whether this will finally result in a breakout, remains to be seen. Although, considering that the BCC fork has already begun, we may observe heightened trading and interest, as future events unfold. The Kraken bitcoin/eur pair began trading on July 16 at €1,611, the month’s present low. After a strong run-up to the €2,490 monthly high (54.81% increase in less than 5 days), a value that was attained on July 20 (GMT 23:00), prevailing trading activity has remained in a fixed range between the €2,116.04 weekly low, and the yet to broken €2,490 monthly high. Projecting the 54.81% ascent, from the prior trading range, on to the existing one, indicates a highly improbable, but nonetheless, still possible high of €3,281.97 ($3,851 at the existing EUR/US Dollar parity exchange rate). 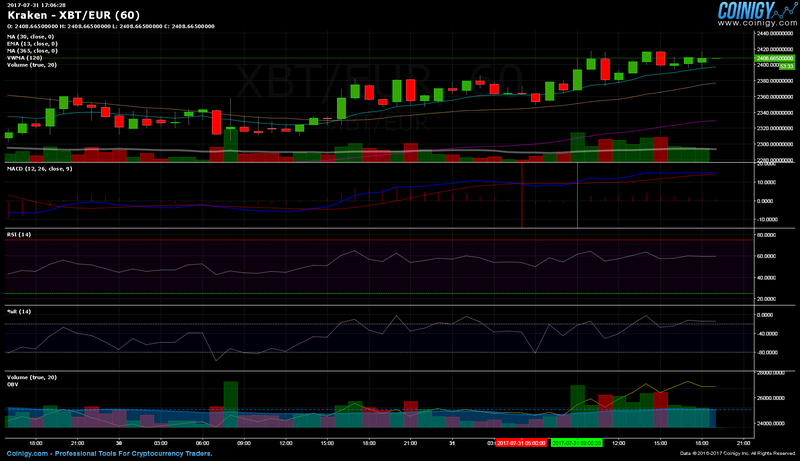 Trading volume is showing signs of stabilizing, on both the hourly and daily charts. This continuation can be expected to last throughout the remainder of the day, as for beyond, the post-fork trading period may end up lasting longer, up until segwit locks in on August 8, or even as far as August 21 during the next wrap-up period, if a consensus is not reached, yet again. The closest support is at €2,299.38, the next one at €2,251.43, while the last foothold (and bottom) of this trading range, is at the €2,116.04 weekly low. 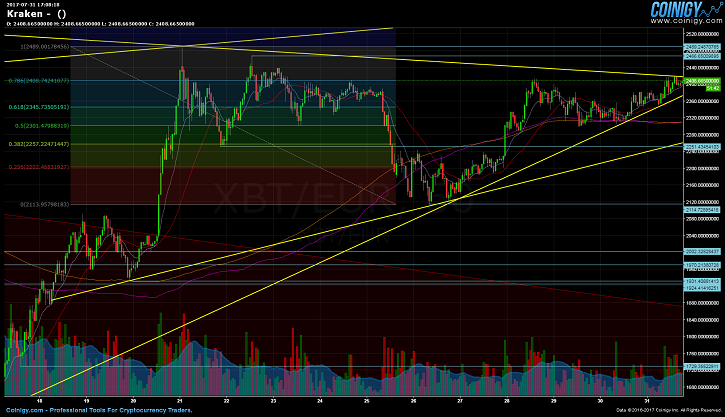 Support levels from prior waves are further below. Beginning in descending order: €2,002.32, €1,970.21, €1,931.40, €1,924.41, €1,729.35, and finally, the last one being the €1,611 support, which is also the monthly low. The first two resistance levels are closely bordering each other, with the nearest at €2,466.65, and the second one, subsequently at the €2,490 monthly high. €2,534.93 is the top of a monumental wick, from the first post all-time high trading range, and is also acting as a strong ceiling. The utmost resistance point is beyond all of them, personified in the €2,618 Kraken all-time high. Bollinger bands on the daily appear to be expanding, this is more often than not, technically a sign of incoming volatility. Be that as it may, the hourly bands show a somewhat consistent and stable gap. Price has pushed above the upper band a few times, and is also holding above the Bollinger median line. This can be accepted as a short term bullish signal. As is the case with Bitstamp’s bitcoin/US dollar pair, a crossover of the 30-day MA above the 200-day MA, has happened on Kraken’s bitcoin/euro pair. 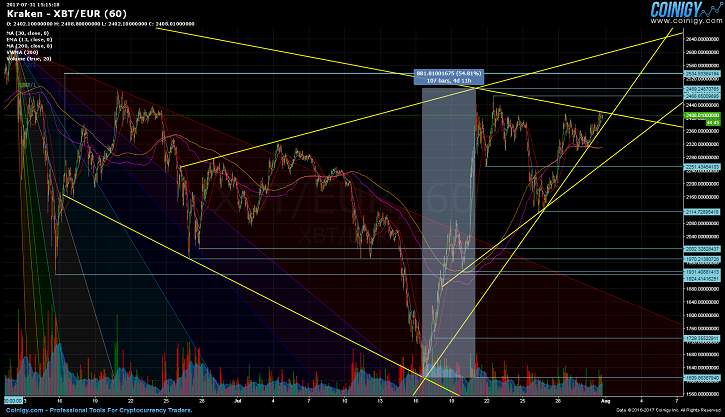 This is bullish as well. The two upper converging trend lines show the €2,490 monthly high, playing an important role moving forward. On top of being a strong support, it is additionally paramount, due to being a conceivable tipping point, in case of a new rally up to the all-time high, and/or beyond to even greater levels. The Fibonacci 0.786 level has been crippled; we could see a lead-in ensue up to the 1.0 fib at €2,489. The next extensions are at €2,577.51 (fib 1.236), €2,632.26 (fib 1.382), €2,676.52 (fib 1.5), €2,720.78 (fib 1.618), and to conclude, at €2,864.05 (fib 2.0). The RSI is approaching overbought conditions; the same applies to the Williams %R indicator. OBV has been rising rather rampantly since the start of the day, and volume was until recently, keeping up with this pace. The MACD is demonstrating momentary bullish tendencies, due to a bullish crossover of the macd, occurring above the signal line. However, a few hours after the day had started; there was a preceding bearish crossover as well (marked with a red vertical line, bullish crossover is marked in green). The Kraken €1,611 monthly low was achieved on July 16. Price did not stay at that level for long, and during the next 4 days of explosive growth, the €2,490 monthly high was touched, after which a short-term reversal, bought the price back down to the €2,116.04 weekly low. Trading has since kept to a confined spectrum, bound by the €2,490 monthly high, and the €2,116.04 weekly low.